Restaurant on-site, Addy's Grill & Lounge open Monday through Saturday 5:00 p.m. Closed Sundays and most holidays. Closed on July 4. 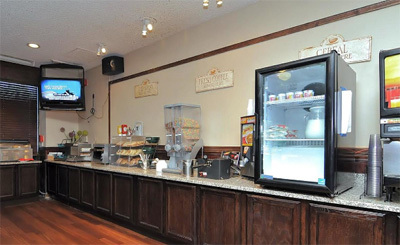 Complimentary full breakfast, includes Belgian waffles, omelete or egg patty, two additional hot items, yogurt, fresh fruit bowl, hard boiled eggs, oatmeal, baked goods, cereal, milk, assorted juices, 24-hour coffee station and more. Meeting facilities 4000 Sq. Ft. meeting ballroom can be divided into four sections. Banquet facilities 4000 Sq. Ft. ballroom can be divided into four sections - full service catering and outside catering. 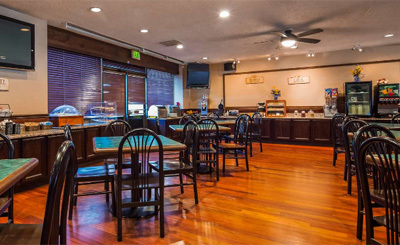 Room service available, hours are 5:00 p.m. to 10:00 p.m.